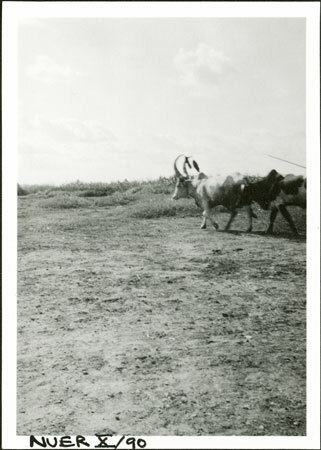 A light coloured ox with large horns and tasselled horn ornaments at Yakwach on the Sobat River. Evans-Pritchard's annotation to a related photograph makes clear that this ox is a marriage-ox, which may well be that one provided by the bride's father during the marriage ceremonies for the groom's family, the meat being taken back to the groom's people who have not been able to attend the wedding. The ox was being driven by a small group of men directly in front of Evans-Pritchard's tent at the cattle camp. Note on print reverse ms pencil - "44 3 A112" & print front border ms ink - "NUER X/90"
Morton, Chris. "Nuer marriage-ox" Southern Sudan Project (in development). 03 Jan. 2006. Pitt Rivers Museum. <http://southernsudan.prm.ox.ac.uk/details/1998.355.493.2/>.